This is the best beer I've had from the brand-spanking new Aztec brewery. Maybe that's because it's the first I've ever had, but, still, I like it. This is a red IPA, a style which not many breweries attempt, but is pretty delicious. For me Hop Head Red is the cake topper, and sadly I don't think this measures up to it. I don't dislike it though! It's got a nice, rich malt base that has some smoky hop flavors. The coloration is, well, red, and thus it's quite reminiscent of a red ale. But it's definitely an IPA at it's core. Hoppy and straightforward malt base. Every other sip or so I get a waft, and taste, of brown sugar, although that doesn't detract from the experience. 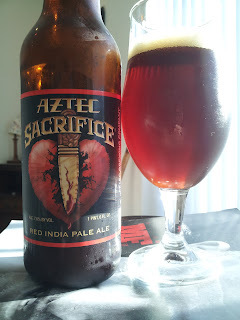 So this means Aztec brewery has had a copyright on the name Aztec Sacrifice as a red IPA for a while, which means they filed for it before the brewery was up and running. Huh? Is it that good that we might start seeing knockoffs? Pretty balsy move, Aztec. I'm thinking of a new red IPA: Aztek Sakrificez. Anyone up for a legal battle? Labels: Aztec Brewing Company, California, red ipa, San Diego, why would you trademark the name of a beer if you're not Budweiser Budvar?